"Maddenia" redirects here. For the prehistoric mammal, see Maddenia (mammal). "Persica" redirects here. For the history book, see Ctesias § Persica. Prunus is a genus of trees and shrubs, which includes the fruits plums, cherries, peaches, nectarines, apricots, and almonds. Native to the northern temperate regions, there are 430 different species classified under Prunus. Many members of the genus are widely cultivated for their fruit and for decorative purposes. Prunus fruit are defined as drupes, or stone fruits, because the fleshy mesocarp surrounding the endocarp (pit or stone) is edible. Most Prunus fruit and seeds are commonly used in processing, such as jam production, canning, drying or roasting. Members of the genus can be deciduous or evergreen. A few species have spiny stems. The leaves are simple, alternate, usually lanceolate, unlobed, and often with nectaries on the leaf stalk. The flowers are usually white to pink, sometimes red, with five petals and five sepals. There are numerous stamens. Flowers are borne singly, or in umbels of two to six or sometimes more on racemes. The fruit is a fleshy drupe (a "prune") with a single relatively large, hard-coated seed (a "stone"). Within the rose family Rosaceae, it was traditionally placed as a subfamily, the Amygdaloideae (incorrectly "Prunoideae"), but was sometimes placed in its own family, the Prunaceae (or Amygdalaceae). More recently, it has become apparent that Prunus evolved from within a much larger clade now called subfamily Amygdaloideae (incorrectly "Spiraeoideae"). In 1737, Carl Linnaeus used four genera to include the species of modern Prunus—Amygdalus, Cerasus, Prunus and Padus—but simplified it to Amygdalus and Prunus in 1758. Since then, the various genera of Linnaeus and others have become subgenera and sections, as it is clearer that all the species are more closely related. Liberty Hyde Bailey says: "The numerous forms grade into each other so imperceptibly and inextricably that the genus cannot be readily broken up into species." A recent DNA study of 48 species concluded that Prunus is monophyletic and is descended from some Eurasian ancestor. 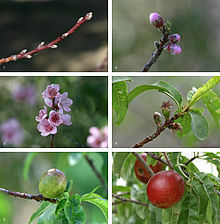 Subgenus Amygdalus, almonds and peaches: axillary buds in threes (vegetative bud central, two flower buds to sides); flowers in early spring, sessile or nearly so, not on leafed shoots; fruit with a groove along one side; stone deeply grooved; type species: Prunus dulcis (almond). Subgenus Padus, bird cherries: axillary buds single; flowers in late spring in racemes on leafy shoots, short-stalked; fruit not grooved, stone smooth; type species: Prunus padus (European bird cherry). Now known to be polyphyletic. Another recent DNA study found that there are two clades: Prunus-Maddenia, with Maddenia basal within Prunus, and Exochorda-Oemleria-Prinsepia, but further refinement shows that Exochorda-Oemleria-Prinsepia is somewhat separate from Prunus-Maddenia-Pygeum, and that, like the traditional subfamily Maloideae with apple-like fruits, all of these genera appear to be best considered within the expanded subfamily Amygdaloideae. Prunus can be divided into two clades: Amygdalus-Prunus and Cerasus-Laurocerasus-Padus. Yet another study adds Emplectocladus as a subgenus to the former. The lists below are incomplete, but include most of the better-known species. The genus Prunus includes the almond, the nectarine and peach, and several species of apricots, of cherries, and of plums, all of which have cultivars developed for commercial fruit and nut production. The almond is not a true nut, the edible part is the seed. Other species are occasionally cultivated or used for their seed and fruit. A number of species, hybrids, and cultivars are grown as ornamental plants, usually for their profusion of flowers, sometimes for ornamental foliage and shape, and occasionally for their bark. The Tree of 40 Fruit has forty varieties grafted on to one rootstock. Species such as blackthorn (Prunus spinosa), are grown for hedging, game cover, and other utilitarian purposes. The wood of some species (notably black cherry) is prized as a furniture and cabinetry timber, especially in North America. Many species produce an aromatic resin from wounds in the trunk; this is sometimes used medicinally. Other minor uses include dye production. Pygeum, a herbal remedy containing extracts from the bark of Prunus africana, is used as to alleviate some of the discomfort caused by inflammation in patients suffering from benign prostatic hyperplasia. Prunus species are food plants for the larvae of a large number of Lepidoptera species (butterflies and moths); see List of Lepidoptera which feed on Prunus. Prunus species are included in the Tasmanian Fire Service's list of low flammability plants, indicating that it is suitable for growing within a building protection zone. Because of their considerable value as both food and ornamental plants, many Prunus species have been introduced to parts of the world to which they are not native, some becoming naturalised. Ornamentals include the group that may be collectively called "flowering cherries" (including sakura, the Japanese flowering cherries). Many species are cyanogenic; that is, they contain compounds called cyanogenic glucosides, notably amygdalin, which, on hydrolysis, yield hydrogen cyanide. Although the fruits of some may be edible by humans and livestock (in addition to the ubiquitous fructivory of birds), seeds, leaves and other parts may be toxic, some highly so. The plants contain no more than trace amounts of hydrogen cyanide, but on decomposition after crushing and exposure to air or on digestion, poisonous amounts may be generated. The trace amounts may give a characteristic taste ("bitter almond") with increasing bitterness in larger quantities, less tolerable to people than to birds, which habitually feed on specific fruits. People are often encouraged to consume many fruits because they are rich in a variety of nutrients and phytochemicals which are supposedly beneficial to human health. The fruits of Prunus often contain many phytochemicals and antioxidants. These compounds have properties that have been linked to preventing different diseases and disorders. Research suggests that the consumption of these fruits reduces the risk of developing diseases such as cardiovascular diseases, cancer, diabetes, and other age-related declines. There are many factors that can affect the levels of bioactive compounds in the different fruits of the genus Prunus, including the environment, season, processing methods, orchard operations as well as postharvest management. Cherries contain many different phenolic compounds and anthocyanins, which is an indicator of being rich in antioxidants. There has been recent research linking the phenolic compounds of the sweet cherry (Prunus avium) with antitumor properties. Reactive oxygen species (ROS) include superoxide radicals, hydrogen peroxide, hydroxyl radicals and singlet oxygen; they are the byproducts of metabolism. High levels of ROS lead to oxidative stress which causes damage to lipids, proteins, and nucleic acids. The oxidative damage results in cell death which ultimately leads to numerous diseases and disorders. Antioxidants act as a defensive mechanism against the oxidative stress. They are used to remove the free radicals in a living system that are generated as reactive oxygen species. Some of those antioxidants include gutathione S-transferase, glutathione peroxidase, superoxide dismutase, and catalase. The antioxidants present in cherry extracts act as inhibitors of the free radicals. However, the DNA and proteins can be damaged when there is an imbalance in the level of free radicals and the antioxidants. When there aren't enough antioxidants to remove the free radicals, there are many diseases that can occur, such as cancers, cardiovascular diseases, Parkinson's disease, etc. Recent studies have shown that using natural antioxidants as a supplement in chemotherapy can decrease the amount of oxidative damage. Some of these natural antioxidants include ascorbic acid, tocopherol, and epigallocatechin gallate; they can be found in certain cherry extracts. Similar to cherries, strawberries, and raspberries, almonds are also rich in phenolics. Almonds have a high oxygen radical absorbing capacity (ORAC), which is another indicator of being rich in antioxidants. As stated before, high levels of the free radicals is harmful and thus, having the capacity to absorb those radicals is greatly beneficial. The bioactive compounds, polyphenols and anthocyanins, that are found in berries and cherries, are also present in almonds. Almonds also contain nonflavonoid and flavonoid compounds, which contribute to the antioxidant properties of almonds. Flavonoids are a group of structurally related compounds that are arranged in a specific manner and can be found in all vascular plants on land. They also contribute to the antioxidant properties of almonds. Some of the nonflavonoid compounds present are protocatechuic, vanillic, and p-hydroxybenzoic acids. Flavonoid compounds that can be found in the skin of the almond are flavanols, dihydroflavonols, and flavanones. Of all of the different species of stone fruits, plums are the most rich in antioxidants and phenolic compounds. The total antioxidant capacity (TAC) varies within each fruit, but in plums, TAC is much higher in the skin than in the flesh of the fruit. Apricots are high in carotenoids, which play a key role in light absorption during development. Carotenoids are the pigments which give the pulp and peel of apricots and other Prunus fruits their yellow and orange colors. Moreover, it is an essential precursor for Vitamin A, which is especially important for vision and the immune system in humans. Moreover, these fruits are quite rich in phenolic substances including, catechin, epicatechin, p-coumaric acid, caffeic acid, and ferulic acid. Similar to the plum, peaches and nectarines also have higher TAC in the skin than in the flesh. They also contain moderate levels of carotenoids and ascorbic acid. Peaches and nectarines are orange and yellow in color which can be attributed to the carotenoids present. Ascorbic acid is important in hydroxylation reactions, such as collagen synthesis and de novo synthesis of bone and cartilage, and wound healing. Ascorbic acid is also a precursor of Vitamin C, which is essential for repairing tissues and absorbing iron. Cherries are prone to gummosis. Various Prunus species are winter hosts of the Damson-hop aphid, Phorodon humuli, which is destructive to hops Humulus lupulus just at the time of their maturity, so it is recommended that plum trees not be grown in the vicinity of hop fields. Corking is the drying or withering of fruit tissue. In stone fruit, it is often caused by a lack of boron and/or calcium. Gummosis is a nonspecific condition of stone fruits (peach, nectarine, plum and cherry) in which gum is exuded and deposited on the bark of trees. Gum is produced in response to any type of wound: insects, mechanical injury or disease. The earliest known fossil Prunus specimens are wood, drupe and seed and a leaf from the middle Eocene of the Princeton Chert of British Columbia. Using the known age as calibration data, a partial phylogeny of some Rosaceae from a number of nucleotide sequences was reconstructed. Prunus and its sister clade Maloideae (apple subfamily) diverged 44.3 mya. This date is within the Lutetian, or older middle Eocene. [c] Stockey and Wehr report: "The Eocene was a time of rapid evolution and diversification in Angiosperm families such as the Rosaceae ...."
The Online Etymology Dictionary presents the customary derivations of plum and prune from Latin prūnum, the plum fruit. 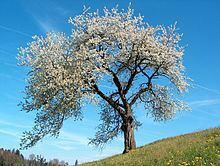 The tree is prūnus; and Pliny uses prūnus silvestris to mean the blackthorn. The word is not native Latin, but is a loan from Greek προῦνον (prounon), which is a variant of προῦμνον (proumnon), origin unknown. The tree is προύμνη (proumnē). Most dictionaries follow Hoffman, Etymologisches Wörterbuch des Griechischen, in making some form of the word a loan from a pre-Greek language of Asia Minor, related to Phrygian. ^ Do a search in the ITIS database on the scientific name Prunus for its current list. ^ Other species appear as well, which for whatever reasons are not yet in ITIS. ^ A date of 76 mya is given for Rosaceae, which is within the late Cretaceous. ^ Seedling ecology and evolution. Leck, Mary Allessio., Parker, V. Thomas., Simpson, Robert. Cambridge: Cambridge University Press. 2008. ISBN 9780521873055. OCLC 191891572. ^ J., Niklas, Karl (1997). The evolutionary biology of plants. Chicago: University of Chicago Press. ISBN 978-0226580838. OCLC 35262271. ^ Velasco, Dianne; Hough, Josh; Aradhya, Mallikarjuna; Ross-Ibarra, Jeffrey (2016-12-01). "Evolutionary Genomics of Peach and Almond Domestication". G3: Genes, Genomes, Genetics. 6 (12): 3985–3993. doi:10.1534/g3.116.032672. ISSN 2160-1836. PMC 5144968. PMID 27707802. ^ a b c d e f g h i j Health-promoting properties of fruit and vegetables. Terry, Leon A. (Leon Alexander). Wallingford, Oxfordshire, UK: CABI. 2011. ISBN 9781845935283. OCLC 697808315. ^ Cullen, J.; et al., eds. (1995). European Garden Flora. 4. Cambridge University Press. ISBN 9780521420952. ^ Linnaeus Carolus (1830). Sprengel, Curtius, ed. Genera Plantarum Editio Nona [Plant Categories, Ninth Edition]. Gottingen: Dieterich. pp. 402–403. ^ Bailey, Liberty Hyde (1898). Sketch of the Evolution of Our Native Fruits. New York: The MacMillan Company. p. 181. ^ Bortiri, E.; Oh, S. H.; Jiang, J.; Baggett, S.; Granger, A.; Weeks, C.; Buckingham, M.; Potter, D.; Parfitt, D. E. (2001). "Phylogeny and Systematics of Prunus (Rosaceae) as Determined by Sequence Analysis of ITS and the Chloroplast trnL-trnF Spacer DNA". Systematic Botany. 26 (4): 797–807. JSTOR 3093861. ^ a b Lee, Sangtae; Wen, Jun (2001). "A phylogenetic analysis of Prunus and the Amygdaloideae (Rosaceae) using ITS sequences of nuclear ribosomal DNA". American Journal of Botany. 88 (1): 150–160. doi:10.2307/2657135. JSTOR 2657135. PMID 11159135. ^ Okie, William (July 2003). "Stone Fruits". In Janick, J.; Paulii, R.E. Encyclopedia of Fruits and Nuts. C A B Intl (published 2008). ^ Liu, Xiao-Lin; Wen, Jun; Nie, Ze-Long; Johnson, Gabriel; Liang, Zong-Suo; Chang, Zhao-Yang (14 December 2012). "Polyphyly of the Padus group of Prunus (Rosaceae) and the evolution of biogeographic disjunctions between eastern Asia and eastern North America". Journal of Plant Research. 126 (3): 351–361. doi:10.1007/s10265-012-0535-1. PMID 23239308. ^ "The Gift Of Graft: New York Artist's Tree To Grow 40 Kinds Of Fruit". NPR. 3 August 2014. Retrieved 3 January 2015. ^ "This tree produces 40 different types of fruit". ScienceAlert. 21 July 2014. Retrieved 3 January 2015. ^ Chladil, Mark; Sheridan, Jennifer (2006). "Fire retardant garden plants for the urban fringe and rural areas" (PDF). www.fire.tas.gov.au. Retrieved 5 December 2017. ^ Armstrong, E. Frankland (1913). "Glucosides". In Davis, W.A. ; Sadtler, Samuel S. Allen's Commercial Organic Analysis. VII (Fourth ed.). Philadelphia: P. Blakiston's Son & Co. p. 102. Retrieved 5 December 2017. ^ Cook, Laurence Martin; Callow, Robert S. (1999). Genetic and evolutionary diversity: the sport of nature (2nd ed.). Cheltenham: Stanley Thornes. p. 135. ^ a b c Nile, Shivraj Hariram; Park, Se Won (2014-02-01). "Edible berries: Bioactive components and their effect on human health". Nutrition. 30 (2): 134–144. doi:10.1016/j.nut.2013.04.007. ISSN 0899-9007. PMID 24012283. ^ a b c d Cevallos-Casals, Bolívar A.; Byrne, David; Okie, William R.; Cisneros-Zevallos, Luis (2006-05-01). "Selecting new peach and plum genotypes rich in phenolic compounds and enhanced functional properties". Food Chemistry. 96 (2): 273–280. doi:10.1016/j.foodchem.2005.02.032. ISSN 0308-8146. ^ a b c d e Liu, Rui Hai (2013-06-01). "Dietary Bioactive Compounds and Their Health Implications". Journal of Food Science. 78 (s1): A18–A25. doi:10.1111/1750-3841.12101. ISSN 1750-3841. PMID 23789932. ^ a b c d Wang, Shiow Y.; Jiao, Hongjun (2000). "Scavenging Capacity of Berry Crops on Superoxide Radicals, Hydrogen Peroxide, Hydroxyl Radicals, and Singlet Oxygen". Journal of Agricultural and Food Chemistry. 48 (11): 5677–5684. doi:10.1021/jf000766i. ^ Usenik, Valentina; Fabčič, Jerneja; Štampar, Franci (2008-03-01). "Sugars, organic acids, phenolic composition and antioxidant activity of sweet cherry (Prunus avium L.)". Food Chemistry. 107 (1): 185–192. doi:10.1016/j.foodchem.2007.08.004. ISSN 0308-8146. ^ Bastos, Claudete; Barros, Lillian; Dueñas, Montserrat; Calhelha, Ricardo C.; Queiroz, Maria João R.P. ; Santos-Buelga, Celestino; Ferreira, Isabel C.F.R. (2015-04-15). "Chemical characterisation and bioactive properties of Prunus avium L.: The widely studied fruits and the unexplored stems". Food Chemistry. 173: 1045–1053. doi:10.1016/j.foodchem.2014.10.145. hdl:1822/39810. ISSN 0308-8146. PMID 25466123. ^ a b c Lee, Bo-Bae; Cha, Mi-Ran; Kim, Soo-Yeon; Park, Eunju; Park, Hae-Ryong; Lee, Seung-Cheol (2007-06-01). "Antioxidative and Anticancer Activity of Extracts of Cherry (Prunus serrulata var. spontanea) Blossoms". Plant Foods for Human Nutrition. 62 (2): 79–84. doi:10.1007/s11130-007-0045-9. ISSN 0921-9668. PMID 17577669. ^ a b c d Wijeratne, Subhashinee S. K.; Amarowicz, Ryszard; Shahidi, Fereidoon (2006-03-01). "Antioxidant activity of almonds and their by-products in food model systems". Journal of the American Oil Chemists' Society. 83 (3): 223. doi:10.1007/s11746-006-1197-8. ISSN 0003-021X. ^ De Souza, Vanessa Rios; Pereira, Patrícia Aparecida Pimenta; Da Silva, Thais Lomônaco Teodoro; De Oliveira Lima, Luiz Carlos; Pio, Rafael; Queiroz, Fabiana (2014-08-01). "Determination of the bioactive compounds, antioxidant activity and chemical composition of Brazilian blackberry, red raspberry, strawberry, blueberry and sweet cherry fruits". Food Chemistry. 156: 362–368. doi:10.1016/j.foodchem.2014.01.125. ISSN 0308-8146. PMID 24629981. ^ a b c Monagas, Maria; Garrido, Ignacio; Lebrón-Aguilar, Rosa; Bartolome, Begoña; Gómez-Cordovés, Carmen (2007). "Almond (Prunus dulcis(Mill.) D.A. Webb) Skins as a Potential Source of Bioactive Polyphenols". Journal of Agricultural and Food Chemistry. 55 (21): 8498–8507. doi:10.1021/jf071780z. PMID 17867638. ^ a b c Gil, María I.; Tomás-Barberán, Francisco A.; Hess-Pierce, Betty; Kader, Adel A. (2002). "Antioxidant Capacities, Phenolic Compounds, Carotenoids, and Vitamin C Contents of Nectarine, Peach, and Plum Cultivars from California". Journal of Agricultural and Food Chemistry. 50 (17): 4976–4982. doi:10.1021/jf020136b. ^ a b Hegedú´s, Attila; Engel, Rita; Abrankó, László; Balogh, Emó´ke; Blázovics, Anna; Hermán, Rita; Halász, Júlia; Ercisli, Sezai; Pedryc, Andrzej (2010-11-01). "Antioxidant and Antiradical Capacities in Apricot (Prunus armeniaca L.) Fruits: Variations from Genotypes, Years, and Analytical Methods". Journal of Food Science. 75 (9): C722–C730. doi:10.1111/j.1750-3841.2010.01826.x. ISSN 1750-3841. PMID 21535583. ^ Sochor, Jiri; Zitka, Ondrej; Skutkova, Helena; Pavlik, Dusan; Babula, Petr; Krska, Boris; Horna, Ales; Adam, Vojtech; Provaznik, Ivo (2010-09-07). "Content of Phenolic Compounds and Antioxidant Capacity in Fruits of Apricot Genotypes". Molecules. 15 (9): 6285–6305. doi:10.3390/molecules15096285. PMC 6257765. PMID 20877223. ^ Legua, Pilar; Hernández, Francisca; Díaz-Mula, Huertas M.; Valero, Daniel; Serrano, María (2011). "Quality, Bioactive Compounds, and Antioxidant Activity of New Flat-Type Peach and Nectarine Cultivars: A Comparative Study". Journal of Food Science. 76 (5): C729–C735. doi:10.1111/j.1750-3841.2011.02165.x. PMID 22417419. ^ "Damson-hop aphid, Phorodon humuli". Rothamstead Insect Survey. Rothamstead Research. Archived from the original on 26 June 2012. ^ Benson, N.R. ; Woodbridge, C.G. ; Bartram, R.D. (1994). "Nutrient Disorders in Tree Fruits" (PDF). Pacific Northwest Extension Publications. Retrieved 9 September 2017. ^ Day, Kevin (27 January 1999). "Peach and Nectarine Cork Spot:A Review of the 1998 Season" (PDF). University of California Cooperative Extension - Tulare County. University of California, Davis. Retrieved 9 September 2017. ^ Hartman, John; Bachi, Paul (November 2005). "Gummosis and Perennial Canker of Stone Fruits" (PDF). Plant Pathology. University of Kentucky. Retrieved 9 September 2017. ^ a b Stockey, Ruth A.; Wehr, Wesley C. (1996). "Flowering Plants in and around Eocene Lakes of the Interior". In Ludvigson, Rolf. Life in Stone: a Natural History of British Columbia's Fossils. Vancouver: UBCPress. pp. 234, 241, 245. ISBN 978-0-7748-0578-0. ^ Oh, Sang-Hun; Potter, Daniel (2005). "Molecular phylogenetic systematics and biogeography of tribe Neillieae (Rosaceae) using DNA sequences of cpDNA, rDNA, and LEAFY1". American Journal of Botany. 92 (1): 179–192. doi:10.3732/ajb.92.1.179. PMID 21652396. ^ a b Dillhoff, Richard M; Leopold, Estella B.; Manchester, Steven R. (February 2005). "The McAbee flora of British Columbia and its relation to the Early-Middle Eocene Okanagan Highlands flora of the Pacific Northwest" (PDF). Canadian Journal of Earth Sciences. 42 (2): 151–166. CiteSeerX 10.1.1.452.8755. doi:10.1139/e04-084. ^ "plum". Online Etymological Dictionary. ^ "prune". Online Etymological Dictionary. ^ "prūnum". Lewis's Elementary Latin Dictionary. Perseus Digital Library. 1890. ^ "prūnus". Lewis's Elementary Latin Dictionary. Perseus Digital Library. 1890. ^ "προῦμνον". Liddell and Scott's Greek-English Lexicon. Perseus Digital Library. ^ "προύμνη". Liddell and Scott's Greek-English Lexicon. Perseus Digital Library. ^ Linnaeus, Carolus (1737). Hortus Cliffortianus. Amsterdam. p. 186. doi:10.5962/bhl.title.690. Retrieved 5 December 2017. "GRIN Species Records of Prunus". Beltsville, Maryland: USDA, ARS, National Genetic Resources Program. Germplasm Resources Information Network (GRIN) [Online Database]. National Germplasm Resources Laboratory. Retrieved 13 November 2009. "Our Cherries Collection — Prunus". Missouri Botanical Garden: Kemper Center for Home Gardening. 2001–2009. Retrieved 13 November 2009. This page was last edited on 16 April 2019, at 20:31 (UTC).